I just did this since this year. Before, I was too afraid to use soflense and I even said to myself that I will not wear it for the rest of my life hahahaha. But since earlier this year, I forced myself to wear softlense for the sake of the wedding. Because my eyes are small (and I also have hooded monolids), my MUA (and also photographer) suggest me to use softlense. After I can wear it, I compeletely fell in love with it hahaha, It's like a magic thing that makes my eyes bigger! Dark color lenses will make my eyes rounder and give me an instant dolly look. 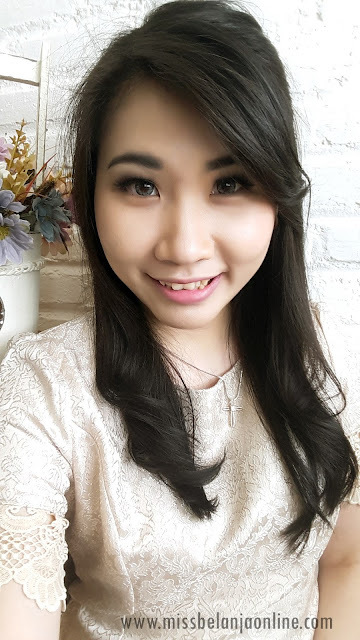 While light color lenses will make my eyes look bigger and give sparkling effect. This is the usual thing that I used since years ago. Hooded eyelids is quite complicated to deal. When I use it higher than my eyelid, it will looks unnatural. If I used it below my eyelid, it helps to lift my fat but not really create a double eyelids. Usually I use it below my eyelids. Eyelid tape is help to create a fake double eyelids, some people said if you used it all the time, after some time it will make a semi-permanent double eyelids. Create a shadow effect on you eyelids, that way it will makes your eyes look slightly bigger. Usually I'll go with dark colors like black and brown. Lastly, finish your eye make up with false lashes. For monolids, try to stick the false lashes slightly higher than your original lashes, then curl it together and apply 1 coat of mascara to make it stick together. It will compeletely make your eyes pop. You can also use 2 layer of false lashes for party look, to make it look thicker. That's all what I do to enhance my small eyes and to make my eyes look bigger. Do you have other tips? Share with me! soft lens! aku masih latian biasain pake eyelid tape, tapi emang bisa banget sih bikin mata jadi besar. Masih blm pede pake bulmat, jadiii masih make mascara berlayer-layer aja deh hihi. Oh iya, sama eyeliner putih/creme di waterline + highlighter di inner corner, cakep!